Article written by Megan Totka, Chief Editor for ChamberofCommerce.com. Small businesses today have plenty on their plates. The challenges and roadblocks faced by modern SMBs are seemingly innumerable; from finance to legislation to something as simple as the office coffee pot going on the fritz. Oftentimes such challenges come when we are least prepared for them. An emerging challenge for SMBs over the course of the last decade comes in the form of our online presence and how businesses handle themselves on the web. With more and more transparency and an increasingly bustling online landscape, the need for small businesses to secure and protect their place online is absolutely vital when it comes to long-term survival. But what happens when things don’t go our way? Our audience and user base and specifically how they perceive our businesses and sites. Our presence when it comes to search engines and our ability to target keywords within our industry. Our ability to keep up with the latest trends in usability and technology when it comes to supporting the aforementioned users. If we keep the above principles in mind, we’re more likely to succeed; however, frustration is only natural when it comes to keeping up our online presence. As the Internet constantly evolves, we must constantly adapt. Frustration is only natural as we chase what we want and struggle to make our sites just plain work. With so many moving pieces, it’s often difficult for us to even begin to grasp what it means to be “successful” online; however, it’s up to us as business owners to take responsibility for our site and never point the figurative finger. Why Can’t You Point the Finger? Playing the blame game will always make your business look weak and can work to make your competition look stronger. The blame game makes your business look like they’re constantly on the defensive, afraid to be held accountable (and in today’ economy, accountability matters). 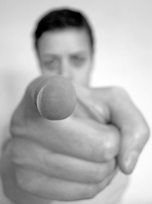 Pointing the finger serves as a distraction, creating excuses that keep you from really getting down to business. Connect to customers directly in a way that we never thought possible. Respond to inquiries, questions, and complaints in real time. Establish a tone and message for our businesses instead of letting someone else do it for us. …we understand exactly why hard work pays off. The fact of the matter is this; the technology surrounding SMB sites is here to stay. We have to adapt before it’s too late; don’t look at your site as a burden, but rather a beacon of opportunity. Businesses of all sizes love to point the finger at Google when things don’t go their way. That doesn’t necessarily mean that they should. Sure, it’s always easy to point the blame at a big, faceless entity, isn’t it? As Google essentially serves as the gatekeeper between SMBs and their precious traffic, don’t they deserve at least some flack? Nope. Google is anything but faceless when it comes to how their search algorithm works and how they work to help SMBs. For example, there are endless blogs and YouTube entries from Google’s Matt Cutts, who details the in’s and out’s of what the search giant considers to be spam and how SMBs can clean up their act. Furthermore, Google provides a number of tools to ensure that small businesses can manage their sites (Google Analytics, Webmaster Tools, etc.) and make money online (Adsense, Adwords, etc.). Think before you point the finger; in the battle for small business success, Google is your ally. We mentioned earlier that accountability matters now more than ever when it comes to our businesses and their sites. This is especially true when it comes to our users. There’s plenty that can go wrong when it comes to our sites. Design flaws. Poor copy. In the midst of such miscalculations, never assume that the user is to blame. If your site is performing poorly, chances are it’s your site that has the issue, not those visiting it. It’s up to you to provide your users what they want once they land on your page. Are you? In short, your small business simply can’t afford to point the finger or push its problems onto another source. Today’s SMBs have to be held accountable for their actions both online and off. Don’t let your site fall to the wayside and don’t try to point the finger if things don’t go your way. Instead, assess the situation accordingly and stay calm. Slow and steady wins the race when it comes to your success online; your site’s survival represents a marathon, not a sprint. Where to put a call to action on your website?